Everybody loves a good pork stir-fry that’s bursting with flavours. But let's try a healthier version of this meat classic. 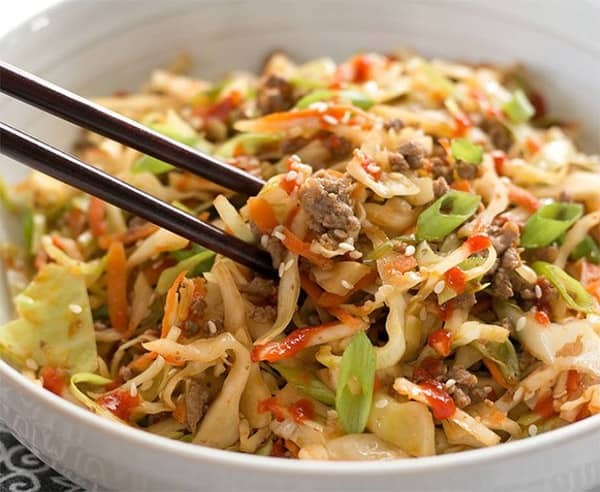 Replace all those highly processed ingredients you usually serve with pork and add freshly shredded cabbage and some chopped apples. Just a teaspoon of freshly grated ginger will be enough to give this combination exactly what it needs. I promise you won’t be able to keep your hand of this amazing recipe. Cut pork into fine strips. Dry fry the pork in a wok, adding a little water if necessary to prevent burning. Remove pork when browned. Dry fry onion, garlic and ginger for two minutes. Add cabbage, green apple and soya sauce and stir fry for three minutes. Sprinkle with sesame seeds. Serve with rice.